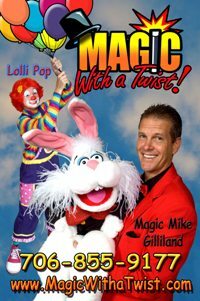 Magic With A Twist was started in the summer of 2001 in Augusta, Georgia. While the company may seem relatively new its artists are not. Founder, Michael Gilliland, is a seasoned performer who has been entertaining people since the age of 8. Michael wanted to not only perform magic but to help children to learn, so he decided to give magic a "twist". His twist has turned magic into an exciting learning tool. Along with being a magician, Michael is also a motivational speaker who combines magic with enthusiasm to create a powerful presentation about the importance of learning and using the imagination. His riveting and enthusiastic presentations excite and inspire children to learn. Each year he finds himself entertaining not only Augusta but also the entire Southeast. Adults, corporate and civic groups will benefit with over 39 years of experience as Michael delivers a totally unique and entertaining blend of humor and magic that audiences will remember long after the performance is over. Michael is also a member of the International Brotherhood of Magicians and the Society of American Magicians. Michael is president of both local clubs at this time. If you would like more information on these magic organizations click on the seals below. Magic With A Twist also offers clean quality inflatables like the Tiger Belly Bouncer, Laser Quest and Looney Tunes Club House to name a few. With so much to offer, Magic With A Twist has a bright and busy future of entertaining people. Magic With A Twist is your one stop shopping experience for a successful and worry free event. Remember we have magic and fun for everyone!